At the invitation of Premier Li Keqiang, Canadian Prime Minister Justin Trudeau will pay an official visit to China and hold the second China-Canada Prime Ministers' Annual Dialogue from December 3 to 7. As important countries in the Asia-Pacific region, China and Canada have extensive converging interests and enjoy broad space for cooperation. Presently, the China-Canada relations maintain a sound momentum of growth and are faced with important opportunities for further development. The two countries boast frequent high-level exchanges and exchanges at other levels and maintain close communication and coordination on international and regional issues with positive progress being achieved in pragmatic cooperation in various areas. The Chinese side attaches great importance to developing its relations with Canada and is willing to join hands with the Canadian side to enhance political mutual trust, deepen pragmatic cooperation, expand cultural and people-to-people exchanges on the basis of mutual respect, equality and mutual benefit so as to move forward the China-Canada strategic partnership. This visit is Prime Minister Justin Trudeau's second visit to China since he assumed office, which aims to hold the second China-Canada Prime Ministers' Annual Dialogue with Premier Li Keqiang. During his stay in Beijing, President Xi Jinping and Chairman of the NPC Standing Committee Zhang Dejiang will meet with Prime Minister Justin Trudeau respectively. The leaders of the two countries will have an extensive and in-depth exchange of views on the bilateral, regional and global issues of common interest. We believe that this visit will inject new impetus into the growth of the China-Canada strategic partnership. At the invitation of Foreign Minister Wang Yi, Mongolian Minister of Foreign Affairs Damdin Tsogtbaatar will pay an official visit to China from December 3 to 5. China and Mongolia are each other's important close neighbors. The development of China-Mongolia relations serves the interests of the two countries and two peoples. Since the new administration of Mongolian People's Party assumed office, it has demonstrated a positive attitude towards developing relations with China. The Chinese side is willing to work with the Mongolian side to move forward the China-Mongolia relations and bilateral pragmatic cooperation. This is the first visit of the Mongolian Foreign Minister since the establishment of the new administration. During the visit, Foreign Minister Wang Yi will hold talks and a joint press conference with Foreign Minister Damdin Tsogtbaatar. The two sides will have an in-depth exchange of views on cementing political mutual trust, deepening pragmatic cooperation, expanding cultural and people-to-people exchanges and advancing China-Mongolia relations. During the visit, Foreign Minister Damdin Tsogtbaatar will meet with the Chinese leaders and leaders of other relevant departments. Q: I have noted that this morning the Foreign Ministry released the information that President Xi Jinping's Special Envoy Wang Jiarui will attend the inauguration ceremony of the Kenyan President. How does China view the current China-Kenya relations? A: At the invitation of Uhuru Kenyatta, the President of the Republic of Kenya, Vice Chairman of the Chinese People's Political Consultative Conference Wang Jiarui will travel to Nairobi, the capital of Kenya to attend the inauguration ceremony of President Uhuru Kenyatta as the Special Envoy of President Xi Jinping on November 28. During the past 54 years since the establishment of diplomatic ties between China and Kenya, bilateral relations have enjoyed sustained, sound and steady growth. Recent years have witnessed the enhancing of political mutual trust and fruitful outcomes being reaped in various areas. The Chinese side always views and develops China-Kenya relations from the strategic and long-term perspective. We are willing to make concerted efforts with Kenya to follow through on the outcomes of the Johannesburg Summit of the Forum on China-Africa Cooperation, jointly advance the Belt and Road Initiative and continue adding more dimensions to the China-Kenya Comprehensive Strategic Cooperative Partnership so as to deliver greater benefits to the two peoples. Q: It is reported that on November 24, Zimbabwe's new leader Emmerson Mnangagwa was formally sworn in as the third President of Zimbabwe and delivered his inauguration speech. In the address, he said that Zimbabwe will take an active part in international affairs and comprehensively develop relations with all parties. He solemnly vowed to protect the security of foreign investment and observe bilateral agreements on investment promotion and protection. How does China view the message conveyed in President Emmerson Mnangagwa's inauguration speech and what is China's expectation for China-Zimbabwe relations after he took office? A: The Chinese side congratulates President Emmerson Mnangagwa on his formal inauguration. We have noted that his inauguration speech has been well received by the people in Zimbabwe and the international community. The Chinese side steadfastly supports Zimbabwe in pursuing a path which suits its own national realities. We believe that under the leadership of President Emmerson Mnangagwa, the national development of Zimbabwe will score greater achievements. China is willing to join hands with Zimbabwe to move forward China-Zimbabwe friendly relations and cooperation in the principle of equality, mutual benefit and win-win cooperation. We will also adhere to the principles of sincerity, practical results, affinity and good faith and uphold the values of friendship, justice and shared interests to continue supporting Zimbabwe's efforts to accelerate economic and social development and improve people's livelihood as our capacity allows. Q: According to media reports, Myanmar's State Counselor and Foreign Minister Aung San Suu Kyi will visit China. Can you confirm this information? When will she visit China and what's the purpose for her visit? Secondly, Reuters has reported that Zimbabwe's intelligence documents showed that China had discussed the removal of Robert Mugabe during General Constantine Guveya Chiwenga's visit to China and that China and Russia had said they wouldn't interfere in Zimbabwe's internal affairs on Mugabe's behalf and will secretly supply weapons to fight Mugabe. Can you confirm this? A: I will take your second question first. As for the visit of General Constantine Guveya Chiwenga, commander of the Zimbabwe Defense Forces to China, we have taken similar questions before. I would like to say that Zimbabwe is a friendly country to China and the two countries have maintained normal exchanges. General Chiwenga's visit to China was a normal exchange between the two militaries and was agreed by the two sides. According to our information, General Chiwenga's visit was approved by former President Robert Mugabe. The Chinese side always follows the principle of non-interference in other countries' internal affairs and this position remains unchanged. As I said just now, the Chinese side is willing to join hands with Zimbabwe to move forward China-Zimbabwe friendly relations and cooperation in the principle of equality, mutual benefit and win-win cooperation. 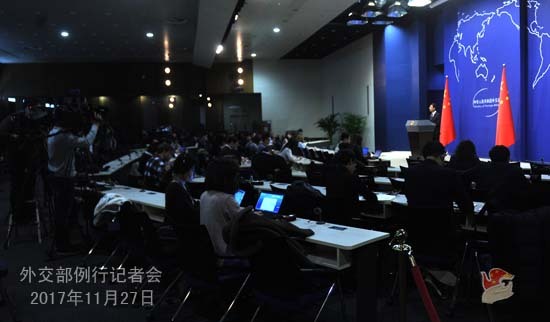 As for your first question, according to our information, the high-level dialogue between the Communist Party of China (CPC) and political parties of other countries hosted by the International Department of the CPC Central Committee will be held in Beijing form November 30 to December 3. The leaders of some foreign political parties and political organizations will be invited to attend the dialogue under the theme of "Fostering a Community of Shared Future for Mankind, Jointly Building a Beautiful World: the Responsibility of Political Parties". As for the attendance of the people from specific countries, I am not aware of the relevant information now and I would like to refer you to competent authorities. Q: According to media reports, on November 24, the terrorist attack targeting a mosque in Egypt's North Sinai province has killed 305 people, including 27 children and injured 128 others. This is the deadliest attack in the modern history of Egypt. What is your comment? 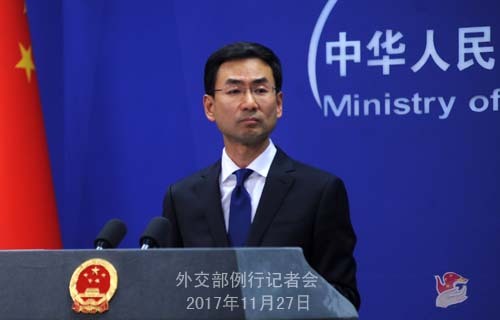 A: The Chinese side strongly condemns the severe terrorist attack in Egypt's North Sinai province. President Xi Jinping, Premier Li Keqiang and Foreign Minister Wang Yi have sent messages of condolences over the attack to Egyptian President Abdul Fatah Al-Sisi, Prime Minister Sheref Ismail and Foreign Minister Sameh Shukry respectively. The Chinese side opposes all forms of terrorism, supports Egypt's efforts to safeguard national stability and stands ready to step up counter-terrorism cooperation with the international community. Q: It is reported that the Argentine submarine San Juan, which has been out of contact for more than 10 days, is still unaccounted for. This has drawn wide attention to the lives of the 44 submariners aboard from the international community. What's your comment on that? A: China pays high attention to the missing of the Argentine submarine San Juan. We express sincere condolences to the Argentine government and the families of those missing, and hope that the search and rescue efforts will make progress. Q: If the news that Myanmar's State Counselor and Foreign Minister Aung San Suu Kyi will visit China is true, we shall say that China and Myanmar maintain very close high-level interactions in the fields of diplomacy and military. Against the backdrop of the Rohingya issue, what's China's consideration in stepping up exchanges with Myanmar? A: You are surely aware that we do not answer hypothetical questions. I just want to say that as friendly neighbors linked by rivers and mountains, China and Myanmar have maintained close communication and exchanges at various levels all along. Not long ago, Foreign Minister Wang Yi paid a visit to Bangladesh and Myanmar, during which he proposed the three-phase solution to the Rakhine State issue and it was agreed by both Bangladesh and Myanmar. 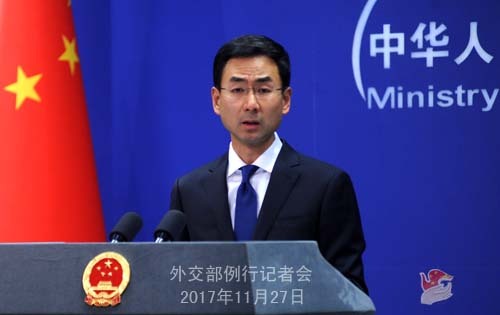 We are pleased to see that positive progress has been made for the situation and China will continue with its constructive role for the settlement of the issue.